Information is key when raising doves. Before purchasing any dove, understand the type of bird, diet, breeding, and housing requirements. 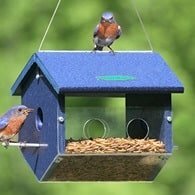 The article below by JD McCoy will help you in determining whether you are equipped for raising domestic birds. So You Would Like to Add Doves to Your Collection? I have received many questions from people who keep pigeons about adding doves to their collections. So when I was asked if I would be interested in writing an article for the Los Angeles Pigeon Club, I thought this would be a great time to address this topic. Like many of you, I started keeping pigeons when I was very young. My love and interests grew for the birds as did my desire to keep different species. I raised Homers, Tumblers and Rollers and learned that methods of keeping varied between these types of pigeons. I also discovered that I had to provide differently for the pheasants I added to my collection. Even more differences were found when I wanted to add Ringneck doves, Diamond doves and now the many species of Exotic doves to my collection. 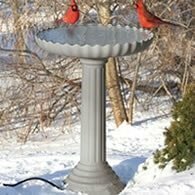 If you already have pigeons, you know the basic needs in housing, feeding, watering, and possibly breeding your birds. I will not attempt to detail each process from start to finish. My goal here is to bring up points that I feel are specific to the care and keeping of doves and how they may differ from your present practices in keeping pigeons. The biggest problem I find that people have when adding doves to their collections is "Not Being Prepared" before the birds arrive. If you are interested in adding doves, do some research first. Talk to people who already keep the birds you think you want. Yes, I said "think you want," because you may change your mind as you learn about the different species. Keep an open mind. With all the species of doves out there, there is one that will probably work well within your desires and abilities. 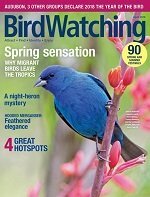 Read all you can about the birds you want. Learn about their behavior in the wild and about their habits in captivity. I have found that most people keeping doves are very willing to take the time to help someone who shows an interest and willingness to learn. Check as many sources as you can. No one is an expert, especially when it comes to living things. By talking with and reading many sources, you will find many tips and methods that may work well for you and your situation. Overall environment is probably the largest factor to deal with. Know your area well, noting the extremes that temperatures can reach, the amount of wind, rain and sun you can expect. Some of the larger doves, like Ringnecks, Wood Pigeons and Australian Crested doves, can tolerate freezing temperatures and harsher weather. However, many of the dove species cannot. If you are unable to provide protected or even heated areas for the colder months, you will want to avoid the more delicate and less cold-tolerant species. A good example in higher management needed is in the raising of Cape or Masked doves. They are originally from the arid regions of South Africa. Capes can be fairly easy to keep as long as they are managed well. They are not cold tolerant at all. The hens tend to be rather delicate and a chill can harm them quickly. I have kept Capes for years here in Maryland, but I must bring them indoors in the Fall and cannot bring them back out until late Spring. I am fairly successful in breeding Capes, but it takes much more management and resources due to the environment in Maryland. In talking to others around the country who raise Capes, I find even when I have had a good year with mine, those living in more arid areas are even more successful. Maryland is very humid through the Summer. It seems the Cape dove does best in areas that are very hot during the day and have low humidity. So, take into account your overall environment, yearly temperatures, humidity, rainfall, winds, and direct sunlight and your ability to alter or manage these when researching the types of doves you would like to keep. Housing requirements can also be very different for doves. Where many of the varieties of pigeon can be kept in the same coop, many of the species of doves cannot. Some doves get along very well while others can be very destructive to any other birds in the same flight. I follow a few rules, which I have found to be generally true. Species that live in different levels of the environment tend to get along. For example, a ground dwelling dove will generally get along with a dove that spends most of its time in the trees. I also find doves from different regions of the world often get along, where species from the same area (often competing for the same resources) do not get along. Construction is also a consideration. When I was flying Homers and Tumblers, I had a single large door to my coop and cannot remember a pigeon flying past me to escape. Do Not try this with doves! If pigeons do escape, you often have a good chance that it will stay in the area and allowing you a chance to catch it. Though there are always exceptions, generally doves that escape will fly away and not be able to survive for long in the wild. I do not know of an exotic dove that can be free-flown and return with any regularity. Some will say that Ringnecks can be free-flown, but I have yet to see a successful program. Doves can be very flighty and will fly upwards towards open light when startled. I recommend building a Man-Trap into all of your outdoor pens or buildings that will possibly have doves in them. A Man-Trap is an enclosed area that you can walk into and completely close behind you before you open the door to any area holding birds. This way if a bird does get by you, it can go no further than the Man-Trap and you can easily retrieve it. I have even seen people build and use portable Man-Traps that they can wheel to the entrance of the desired flight and enter safely. If a Man-Trap is just not possible in your situation, I have found that lower doors do much better to reduce escapes. Build doors narrow and as low as possible that you can still stoop through. Ceiling requirements can also be different for keeping doves. The escape instinct of most doves is to fly up and away quickly. Many dove keepers find that stretching a small holed plastic netting about six inches or so below the ceiling of a coop or the welded wire of a flight greatly reduces scalping and more severe injuries from startled doves. Many doves also seek the highest areas of a coop or flight to roost in. I have heard of birds choosing to roost high and exposed to the elements rather than low and under the cover. They do not always do what is best for them when following instincts. Because of this, if the pen has an open wire flight area as well as a covered area for protection, it is better for the covered area to be taller inside than the wire flight. 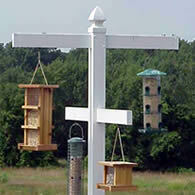 Provide safe perches in the taller areas or the birds may be putting themselves in awkward positions to roost high. Looking at the lower level of your pen, many doves spend a great deal of time during the day on the ground, searching for seeds and bathing in the sun. Some species even nest on the ground or very close to it. It is important to provide clean, dry areas on the ground available to direct sunlight for your doves. My last point on overall housing is on plantings. I rarely see pigeon coops or flights planted with live vegetation. With doves, having potted or planted vegetation often means the difference between a successful program or not. The plants serve a number of purposes with doves. 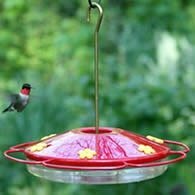 They provide a more natural surrounding, more variety in perches, greater sense of security in cover to hide in and obstacles to slow down a driving male. With pigeons and doves being in the same family, they do eat much of the same food. The size of the seeds often correlates with the size of the birds. If you put a good quality pigeon mix in front of smaller doves like Zebra or Diamond doves, the larger peas and seeds will be left while the millet and grass seeds will be gone. Research is still the key. It is important to know the natural diet of the birds to be kept. But, it is equally important to know what the birds have been eating at their last home. It is often too great a shock for doves to completely change their diet, especially when combined with the stresses of changing environments and homes. Be sure to have the last owner send feed along or tell you the last diet they were fed. If you plan to switch diets, do it gradually over a period of time. It has been proven that many doves do not need grit to survive; however, many do seem to enjoy having it available. Generally it is good to have a fine, starter sized grit available at all times. I also like to mix a little fortified red mineral salt in with the grit. Fresh water is a must at all times. It is very helpful to know where they are used to finding water in their last flights. Present water in as close to the same area as possible. With new birds, I provide water in many different areas of the coop or flight and gradually remove or move the sources towards the final location. Many of the dove species benefit from other forms of feed as well. I provide a variety of soft foods. From time to time, I offer steamed rice, cornbread, mealworms, chopped fresh vegetables and hard boiled eggs crushed shell and all. They may not take to the varied foods at first, but quickly learn to seek them. With some doves, diet is very complex in comparison to feeding pigeons. The digestive system of Fruit doves requires completely different things to be prepared and fed. They are not set up for and cannot digest a regular seed diet. These are very high maintenance birds to keep and are not recommended for starters. You will also need to approach breeding doves differently than pigeons. Where many pigeons will breed together in a large coop as long as nests are available and some territory can be established, most doves will not. Very few of the doves will breed in colonies unless very large areas are provided. Many doves are not comfortable going into an exposed box or closed compartment to nest. They often prefer open basket style nests that are well hidden. They generally are poor nest builders, so bowls or platforms with edges are very helpful. I try to provide at least two nest sites per pair of birds in the flight. I position the nest baskets in varied locations and heights throughout the flight. It also seems more important to provide some form of cover to help hide the nest location for doves. For example, Golden-hearts tend to be difficult to get to nest, incubate and raise the young without abandoning at some time. If you visit a friend of mine that I find to be very successful at raising these birds, you will wonder if there is any room left in the Golden-hearts flight for the birds. The flight is so overgrown with vegetation, that it is wonder he ever sees the birds. They surely must feel safe, secure and well hidden. They breed and raise young for him on a regular basis. I also mentioned previously that plantings and cover could be helpful during breeding. rather aggressive, even harmful to the female. Cover and obstacles can be helpful to the hen in escaping and hiding from the male during this time. Some doves breed and raise very well in captivity. For those that do not, setting up foster parent pairs might be necessary. This added process should be taken into account while looking into what doves to keep. So, if you are currently successful at raising pigeons, chances are you will also be so with doves. As long as you research the types of doves that will best fit your situation and make a few adjustments in your flights and management practices, you should get great enjoyment from adding them to your collection. Raising doves requires a committment of time and knowledge. Please do as the author recommends. Read as much as possible and talk to others who are successful at raising doves.